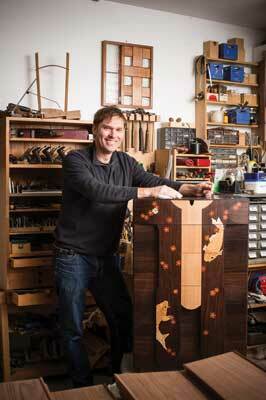 Born in Melbourne in 1968, Adrian Potter is an artist, woodworker and teacher who makes furniture and objects that tell stories. Adrian works on the edges of craft, design, sculpture and decorative art, creating work that defies rigid categorisation. This raises questions about what furniture - and works of art - can be. Adrian Potter: I'm completing my part of a collaborative commission with glass artist Nick Mount. Our client owns one of my pieces, 'The Tattooed Chest', and loved it so much that they wanted an addition. This piece has flowers and koi inlaid into the front in a Japanese style. So we followed the fishing theme for this collaboration: Nick has blown a large fishing float â€“ 400mm long â€“ that is suspended by a fishing pole coming out of the mouth of a carved koi. I'm doing the carving and woodwork. AP: This would have to be my marking knife. It has been in my kit for so long I can't remember where it came from. I use it all the time and it is great for carving with too, or levering small objects up. In its past life it used to be a knife for food - 'Thos Temporal Sheffield - Diamond Edge' is stamped into the end. I only wish it did have a diamond edge so that it wouldn't need to be sharpened so often. AP: A 610mm Delta scrollsaw. It is a heavy thing but I have used it a great deal for inlays. It is a great tool for children to use too because they can safely play around making shapes. 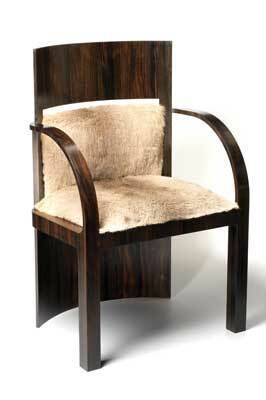 AP: George Ingham's Chaise Lounge - made in 1991 - is an amazing piece. The woven seat and back have such gorgeous compound curves offset by the straight outer frame work. An amazing piece. AP: I actually dreamed of being a musician. I still enjoy playing music but being tone deaf isn't beneficial to a career in music! I fell in love with wood while searching for tone-woods for the electric guitars I was building, then I discovered A Cabinetmaker's Notebook by James Krenov and I was hooked. AP: These days it is ideas primarily. I like telling stories with a particular piece or set of pieces. Lately I have been experimenting with tattoo and graffiti imagery on furniture and objects. Not so long ago tattoos and graffiti were synonymous with rebellion and seen as ugly. Now they have become generally popular and I am especially interested in that perceptual transformation. AP: Well, lately with the tattoo work, it would have to be Black Sabbath or Metallica! AP: I admire the diversity of styles, materials and techniques available to designers and makers. There are so many different ways to do things now â€“ from completely digital to completely hand work. It is an interesting time to be designing and making. AP: George Ingham - 1940â€“2003 - was a great teacher and mentor for me. He was an amazing man to boot. He remains a great inspiration. AP: It would be difficult to make an object without considering both from the outset. That said, for the last 10 years the design, or at least the idea, is first for me. How an object is to be made usually gets fed back into the design and improves it. AP: I don't really know. If you can make a Windsor chair from green wood, sell it and make a living from it, then great. It is equally great if you can feed the family by producing objects to sell only using a 3D printer. AP: A significant portion of my work comes from commissions â€“ past clients or word-of-mouth. I have had a number of solo exhibitions and many group exhibitions all around Australia. 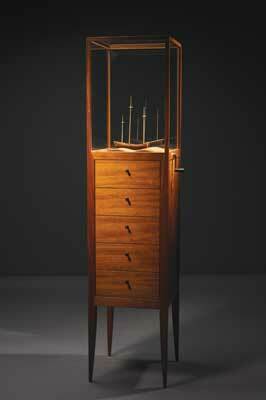 There are very few galleries left in Australia where bespoke furniture pieces can be speculatively placed for sale - Bungendore Wood Works Gallery is the premier location in this country. AP: I am happy to make for other designers. It is fun, but too often the details - like how the door will be hinged for instance - are not considered. Although that is probably why I am asked to make the piece in the first place. AP: A Christmas pudding - sometimes you get a sixpence. AP: A bit of both - it depends on what I'm doing at the time, or perhaps how my work is perceived by others. AP: I consider the brief thoroughly: who is it for, how, where will it be used, etc. I then generate ideas for what is wanted by sketching and imagining shapes and forms. I use solid modelling software on the computer to get the proportions and form right. How it is to be made is considered. The computer model helps me and the client - if there is one - to see the finished result before making starts. AP: Never. Plenty of people are keen to make furniture in some way or other. They may not have the skills just yet or the tools. AP: Keep your practice diverse and learn as many skills as you can. Ultimately, your skills are what you will generate income from. AP: Dust. I wish there was a machine that sucked up or transformed dust and shavings into something not so dusty.